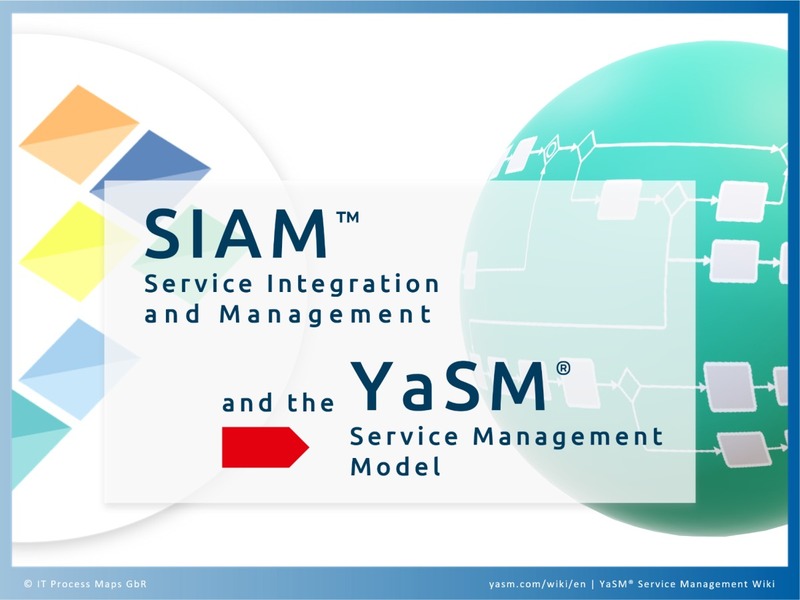 YaSM® and SIAM® (Service Integration and Management) have the same roots in established service management best practice such as ITIL® and ISO 20000, so the key concepts in SIAM can also be found in YaSM. 1 What is the difference between YaSM and SIAM? YaSM and SIAM have different objectives: While SIAM outlines an 'ecosystem' and model for managing multiple suppliers of services, YaSM is a concise and detailed process model for service management with ready-to-use process templates. SIAM focuses on the challenges of integrating supporting services sourced from multiple suppliers into seamless customer-facing services. Organizations are advised to develop tailor-made SIAM models in line with their specific requirements, where a SIAM model is composed of elements such as practices, processes, layers, functions, roles, etc. SIAM doesn't describe processes but capabilities and practices. Organizations that wish to adopt the SIAM approach typically draw on processes from other service management frameworks and enhance these processes, as necessary to support the integration of multiple-sourced services. This is where the YaSM® Process Map comes into the picture: It contains many of the processes that are typically part of a SIAM ecosystem, and for every process it provides detailed process and document templates. With its clear-cut, easy-to-read structure, the YaSM service management model offers the flexibility to adapt the processes to the specific requirements of the organization. In addition, YaSM is aligned with the most widely used service management practices and allows service providers to benefit from guidance that is somewhat outside the focus of SIAM, such as the time-tested life cycle approach for managing services. Organizations using the YaSM process templates are also well on track if they intend to get certified against ISO 20000. Note: YaSM is not endorsed by the authors of SIAM and YaSM cannot claim to be a 'SIAM process model'. SIAM itself is not a collection of processes, but 'draws on and uses other management processes' [Scopism, 2017-1]. Many of these processes are well known from other service management practices, especially ITIL® and ISO 20000, and therefore they are also contained in the YaSM process model. As the authors point out in the SIAM Professional BoK [Scopism, 2017-3], 'it is important to ensure that the roles and responsibilities, interface and dependencies of the customer, service integrator and service providers are mapped, clearly defined, and clearly understood'. Processes, and an integrated process model across all involved parties, are thus a key element in every SIAM model. There is no definite and universally accepted list of SIAM processes, because individual organizations will need to create their own, tailor-made process models. The SIAM Body of Knowledge, however, includes a list of some common processes that support SIAM, including generic descriptions (see [Scopism, 2017-2]). For detailed process descriptions, SIAM refers to other service management frameworks and standards. In the following table, we use this list of 'typical SIAM processes' to illustrate how the YaSM process model is a good starting point for all organizations that wish to adopt the SIAM approach. In particular, we show how each SIAM process has corresponding processes and process templates in the YaSM model. In addition, we indicate the YaSM document templates that are relevant for these processes in a SIAM ecosystem. Service portfolio management is responsible for maintaining a single source of service information. This process ensures the information in the service portfolio and the related service definitions are an accurate representation of the services managed by the service provider. Service monitoring ensures service levels and service usage are constantly monitored. These measurements are key inputs to the service quality reports, which are produced on a regular basis to identify areas where service quality must be improved. Service monitoring ensures the service infrastructure and services are constantly monitored, producing alerts if any irregularities are detected so that appropriate corrective action can be taken. Incident management manages incidents that are affecting the availability of a service. The process seeks to restore the service within an agreed timescale, depending on the priority of the incident. In the YaSM process model, the incident management process is also in charge of fulfilling service requests. Problem management is responsible for managing the lifecycle of a problem, where a problem is the underlying cause of one or several (potential) incidents. Reactive problem management is concerned with solving problems in response to one or more incidents that have occurred in the past. Proactive problem management tries to prevent incidents from occurring in the first place. The YaSM process model includes a change assessment process to make sure modifications to the services and their underlying components are made only after careful consideration of risks and potential side-effects. Changes required for new or substantially changed services are typically tested and deployed through the service build process. Changes on a minor scale, required for example to improve a service or resolve a problem, may be implemented through the service improvement process. Configuration management identifies, records, maintains and assures information about configuration items (CIs). To this end, the process maintains a configuration model, which defines the types of CIs to be managed through the configuration management system (CMS). While SIAM suggests that service level management is a process of its own, YaSM takes the view that service levels are managed through the service lifecycle processes. For example, the required service levels are defined during the service design stage. Services are built to meet these requirements in the service build stage. Service operation is responsible for monitoring service levels and producing service quality reports. Where required service levels are not met, corrective action must be taken as part of service improvement. The supplier management process manages supplier performance and takes corrective action of contractual commitments are not fulfilled. This includes negotiating contracts with service providers, managing disputes and reviewing contracts on a regular basis. The activities in this SIAM process are included in the YaSM process for managing suppliers (see above). The customer relationship management process is responsible for building and maintaining strong relationships between the service provider and its customers. This includes obtaining regular feedback from customers through customer meetings and surveys. Financial management ensures that the required financial resources are available for setting up, operating and improving the service provider's range of services. In particular, this process is responsible for preparing the financial budget, producing financial reports and processing customer invoices. Security management develops and implements policies and procedures for protecting the service provider's assets, aligning the security needs of the service provider with those of its customers. Key activities in this process include identifying assets, vulnerabilities and threats, as well as setting up security controls to mitigate or eliminate those threats. Continual service improvement is in charge of identifying potentials for service improvement and managing service improvement initiatives. A consistent approach to improvement should also be applied to the service provider's processes. These activities are included in the process for maintaining the service management system. The SIAM process guides include a process specifically for managing knowledge. YaSM takes the view that virtually all processes capture knowledge and make it available in a controlled manner, so it's not useful to have a separate knowledge management process. The documents listed on the left are examples for templates that can ensure consistent capture and dissemination of knowledge. The YaSM process model defines where particular types of knowledge are created and how knowledge is maintained. In the YaSM model, the required tools to support the organization's services are specified during service design. Standards for data and interfaces between tools used by different parties are defined in the requirements specifications. The strategic process provides guidance for the use of technology and defines the core technologies to be used in the organization. Project management is in charge of completing projects on time, on budget and at the appropriate level of quality. The service improvement process verifies if the services are being delivered in accordance with documented requirements. The process for maintaining the service management system performs regular process reviews, for example to verify that the processes are in conformance with applicable policies and standards. Further audits and reviews are performed in other YaSM processes, for instance in security management and compliance management. A closer look at these stages and their objectives suggests the SIAM roadmap is not a blueprint for a one-time initiative but of an ongoing effort to adopt and maintain the SIAM ecosystem. This is especially true of stage 4, which contains activities for day to day service delivery and continual service improvement. The SIAM roadmap is thus somewhat similar to the service lifecycle concept known from other service management practices, and the YaSM lifecycle processes (and the corresponding process templates) are a good starting point for organizations that wish to implement SIAM and continually improve their SIAM model. The service integration layer (also referred to as the 'service integrator') in the SIAM ecosystem governs and coordinates the services provided by multiple suppliers. The service integrator is thus an intermediary between the various service suppliers and the customer-facing organization. The service integrator layer is unique to SIAM, but one could argue that all service management frameworks and standards provide guidance for managing supporting services provided by multiple suppliers. ITIL, for example, includes a supplier management process, and ISO 20000 specifies requirements for the management of external suppliers that provide or operate processes, services or service components. Therefore, the YaSM model also includes processes that are concerned with service integration. A key process for effective service integration is service portfolio management (SP2: Maintain the service portfolio), which ensures that accurate, up-to-date information is available for all customer-facing and supporting services, including services supplied by external parties. LP1: Set the strategic direction - Service integration starts with determining, and periodic reviewing, the capabilities and services that are to be provided by external suppliers. This decision must be taken at the strategic level based on factors such as service complexity, organizational maturity, regulatory environment, etc. LP2: Design new or changed services - Service requirements are specified during the service design stage. This includes the specification of any required externally supplied services, to ensure these supporting services are aligned with the requirements of the customer-facing services. LP5: Improve the services - The service improvement process performs regular service reviews to check if the delivered service quality is in line with the contractual commitments and to identify potentials for improvement. Service integration is an important aspect during the reviews, since poor quality of (customer-facing) services can be caused by external parties not fulfilling their contractual obligations. SP11: Manage suppliers - Supplier management is responsible for negotiating supplier agreements, evaluating supplier performance and resolving supplier disputes. For example, they can assign the responsibility for service integration to the service owners, who will ensure that customer-facing services and any required supporting services are aligned. The service owners are supported by service portfolio management, which provides accurate information about all services and checks consistency between the customer-facing and supporting services. Another option is the addition of a service integrator role to the YaSM model. In this scenario, the service integrator would support various other roles as the services are managed across their lifecycle, with a special focus on ensuring that all service providers contribute to the end to end service. SIAM presents a list of typical roles for each layer of the SIAM ecosystem. When mapping the roles and responsibilities in detail, organizations are advised to take into account the multi-supplier environment in which they operate. Many typical SIAM roles can be found in the YaSM process model and in the YaSM RACI matrix, as highlighted in the following list of exemplary SIAM and YaSM roles. Head of service integration This is a specific SIAM role in the service integration layer of the SIAM ecosystem. Users of the YaSM model may add this role to the process model, or assign this responsibility to an existing YaSM role, such as the service portfolio manager. There is no direct match for these roles in YaSM. The YaSM model assigns these responsibilities to the supplier manager. A short introduction to SIAM 'Service Integration and Management' and the SIAM Foundation Body of Knowledge.